Thu, Mar 15, 2018, 08:07 pm SL Time, ColomboPage News Desk, Sri Lanka. 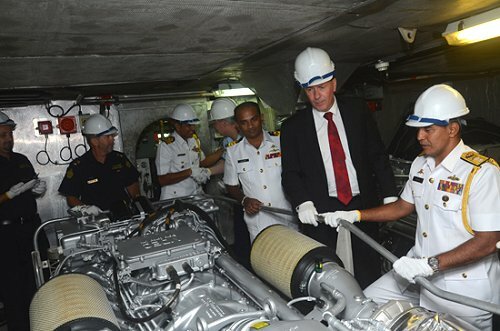 Mar 15, Colombo: Strengthening the long standing bilateral relationship between Australia and Sri Lanka further, the Australian Government has provided two main engines for the Sri Lanka Navy Ship (SLNS) Mihikatha. 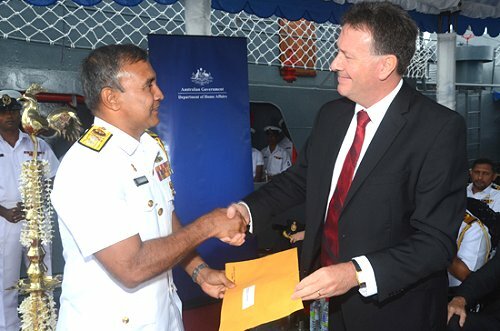 High Commissioner of Australia to Sri Lanka Bryce Hutchesson, on Wednesday as the chief guest of the occasion officially handed over the two engines to the Deputy Chief of Staff and Director General Operations of the Navy, Rear Admiral Piyal De Silva at the base pier of SLNS Dakshina in Galle. SLNS Mihikatha, a Bay Class patrol boat gifted by Australia, joined the SLN Fleet on 29th March 2014 and was commissioned on 9th July 2014. The 38.2-meter long ship with a maximum speed of 24 knots, can cover a range of 3,000 nautical miles. Mementoes were also exchanged between the two parties to signify the importance of the occasion. Commander Southern Naval Area, Rear Admiral Kapila Samaraweera, Deputy Area Commander, Commodore Hasitha Gamage, senior naval officers, dignitaries attached to the Australian High Commission to Sri Lanka and the Maldives and naval officers from Australia were also present on the occasion.